We are just days away from deciding who will represent the NFC and AFC in the Super Bowl. With so much on the line, we thought we’d do what we do best here at PFF: rankings. These are how the grades stack up for all four teams. It’s not surprising that this is the strongest positional group. All four quarterbacks graded inside the top 10 this season. Patrick Mahomes’ game-to-game consistency earns the top spot though. He only had one game grade below 65.0 while everyone else had at least three. From there, the only debate was Tom Brady or Jared Goff at three. Goff started the season on fire and was the third-highest-graded quarterback in the NFL through 10 weeks. His late-season lull though gave Brady the nod. The emergence of C.J. Anderson throws a bit of a wrench into things here. Still, Alvin Kamara has consistently been the most elusive of all the backs over the last two years, while Mark Ingram II has averaged the most yards after contact per attempt this season (3.2). 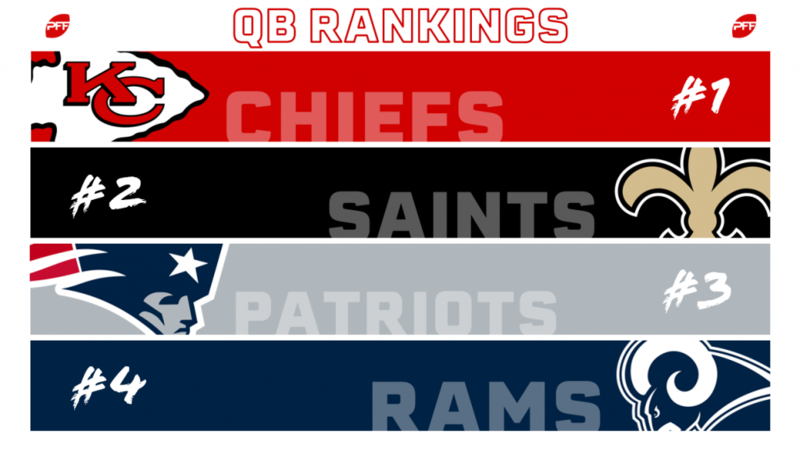 Kareem Hunt would have sent the Chiefs to the top of these rankings, but that doesn’t mean that Damien Williams is any slouch in the fourth spot. His 2.7 yards after contact per attempt this season is more than respectable. Another unit where all four teams would classify as above average. 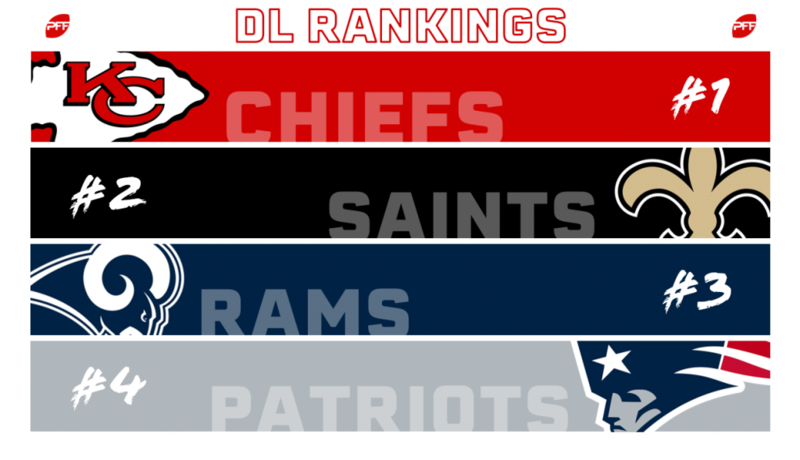 In our end of season offensive line rankings the Patriots finished third, followed by the Rams sixth, Saints eighth, and Chiefs 13th. What separates the Patriots from the rest of the group is the lack of holes. The lowest-graded Pats starter is left tackle Trent Brown with a respectable 66.9 overall grade. Every other unit has a starter graded out below 60.0. The other three though feature arguably the three best tackle tandems in the NFL. The Saints Terron Armstead and Ryan Ramczyk were both top-three at their respective tackle positions, while the same thing can be said for the Rams Andrew Whitworth and Rob Havenstein. Then there’s the Chiefs who feature PFF All-Pro right tackle Mitchell Schwartz and Eric Fisher, whose 71.7 grade this season is competent enough on the left side. There wasn’t a scarier wide receiver in all of football this season than Tyreek Hill. He broke the PFF record for deep receiving yards with 754. Add in Travis Kelce who had the second-best yards per route among tight ends along with Sammy Watkins and you have the best receiving corps in football. The Rams would have made it a debate with Cooper Kupp healthy, but Josh Reynolds hasn’t come close to replicating Kupp’s production. Kupp averaged 2.27 yards per route before going on IR while Reynolds has averaged 1.24 this season. The Patriots are a clear fourth place without Josh Gordon and a Gronk impersonator at tight end. Maybe the most hotly contested debate of any positional group. The Chiefs have the pass-rushing prowess at the top though with Chris Jones (91.2), Dee Ford (91.0), and Justin Houston (89.7) all earning elite pass-rushing grades this season. The Saints earn the second spot with their depth. Cameron Jordan (89.7), David Onyemata (83.5), Alex Okafor (72.0), and Marcus Davenport (71.8) all earned above-average grades on the year. Aaron Donald was in his own planet though. He totaled almost as many pressures (106) as Jordan and Sheldon Rankins (who will miss the remainder of the season with an Achilles injury) combined (112). Linebacker is without a doubt the weakest positional group across the board. Demario Davis is the highest-graded of the bunch with only a 75.5 overall grade. In fact, the Saints own the three highest graded linebackers as Alex Anzalone and A.J. Klein’s grades of 71.8 and 69.7 respectively hold up. The Rams’ Cory Littleton is the dark horse of the group though, as his eight pass breakups were the most in the league this season. It’s been a decidedly down year for Dont’a Hightower, who’s only gotten his hands on one pass all season long (coincidentally in the Chiefs game) and has allowed a passer rating of 100.6 in coverage. The Chiefs are clearly the worst, as Anthony Hitchens was the lowest-graded linebacker in the NFL. 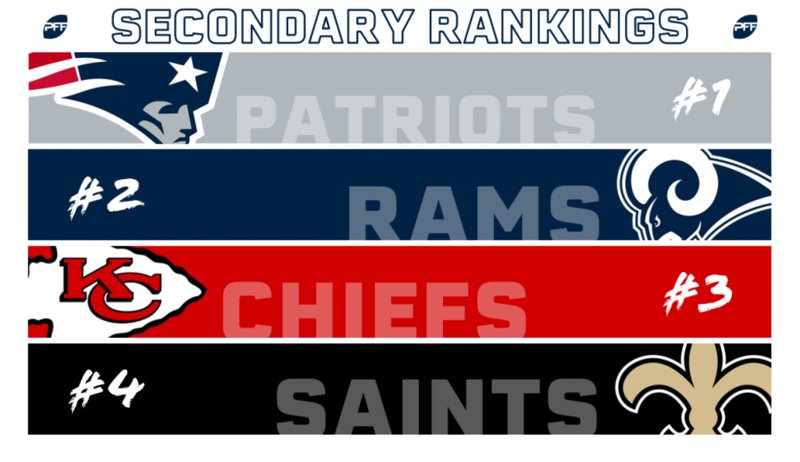 In our end of year secondary rankings the Patriots finished second, Rams sixth, Chiefs 17th, and Saints 28th. It was a career year for Stephon Gilmore that saw him as PFF’s highest-graded corner and first-team All-Pro selection. He carries them to the top spot. The return of Aqib Talib earns the Rams the second spot and the underrated play of Nickell Robey-Coleman from the slot is also helping. His 82.6 overall grade was top-three among full-time slot corners in the league. The Saints are capable of better play than their ranking shows, but P.J. Williams (56.4) and Ken Crawley’s (50.7) disastrous overall grades this season are what dragged them down in the season-long ranking.